What are the best ways to communicate corporate social responsibility (CSR) through social media? Is it simply providing information about what your company is doing to contribute to society? What if social media users begin to ask questions or make comments about CSR programs? How do companies react to consumers’ comments or questions? Demonstrating CSR in the context of the environment, society and the world at large has long been regarded as an excellent strategic move, not only for social good, but also for cultivating a positive business environment. Many studies have demonstrated the usefulness of CSR programs in obtaining stakeholder support, fostering consumer loyalty and more. On social media platforms especially, companies do not have control over the flow of information. However, this assumes that stakeholders (e.g. consumers, local community, etc.) are familiar with such CSR programs, recognize their contributions to society and are in turn supportive of the companies that sponsor the programs. Easily overlooked, communicating CSR efforts to stakeholders is as important as CSR implementation itself, but many companies face difficulty when trying to effectively communicate their CSR efforts to stakeholders. On social media platforms especially, companies do not have control over the flow of information. Even if a company carefully and strategically selects, shapes and frames its CSR message to be delivered to stakeholders, social media users can produce content and share such messages with other users that are impossible to predict or control. What if a company begins to see an overwhelming number of negative comments and skeptical reactions toward its CSR messages? The paradigm of delivering one-way corporate messages to stakeholders does not apply to social media platforms, which are perhaps best for facilitating dialogue and interactions with stakeholders. It is an intriguing idea to approach social media as more of a channel for open dialogue in which a company’s strategic communicator, consumers and communities can share their voices and interact with one another in a fluid environment. However, when we observed some companies’ unsuccessful CSR campaigns, the idea of two-way symmetrical communication that facilitates and promotes the collaborative building of CSR appears to be risky and overly idealistic. For example, when McDonald’s launched the #McDStories Twitter campaign, the company probably hoped that the hashtag would inspire heart-warming stories about McDonald’s. Instead, the campaign attracted critical tweets in which people began to share their horror stories with the restaurant chain. Does the approach of promoting “engaged communication” among stakeholders on social media only work when a company already has built a fair amount of goodwill with such stakeholders? Might there be a need to have a degree of control over the flow of communication for a company without an established good reputation? Respondents reacted better to the stakeholder response strategy in comparison to other communication strategies. 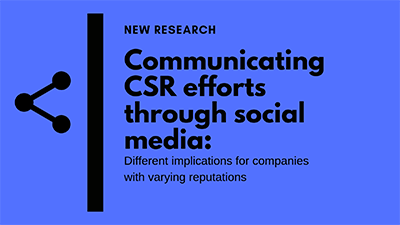 We also explored whether a company’s prior reputation plays a crucial role in determining how stakeholders react to different CSR communications on social media, as well as how such strategies impact respondents’ reactions to the company, including corporate identification, attitudes, supportive communication intent and purchase intent. One of the key findings of the study was that a reputable company might enjoy the benefits of all three CSR communication strategies, while research participants showed the most positive reactions toward a collaborative, engaged CSR communication strategy. Conversely, for a company with a bad reputation, respondents reacted better to the stakeholder response strategy in comparison to other communication strategies. The study’s full findings will be presented by the International Communication Association’s Public Relations division in May 2019. The full manuscript and findings will also be published in a communications journal later this year. This study was supported by a Page/Johnson Legacy Scholar Grant from the Arthur W. Page Center. The 2017 grants funded projects focused on digital media. For more information on this study, email Kim at yskim.payne@gmail.com.